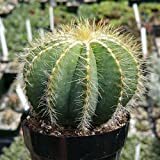 Parodia magnifica growing cactus of the genus Parodia also known as Ball cactus, Parodia magnifica perennial plant and used as ornamental drought tolerant plant, can grow in desert, mediterranean, subtropics or temperate climate and growing in hardiness zone 10-12. Stem color green (and rarely yellow) the shape is oval, the spines cover the entire stem angles white or yellow color. Flower color light yellow, the flower bloom on top of cactus in bowl shape.